OK when the communists almost ran over the whole of the Korean Penninsula half a century ago : this was spelled Pusan for simpler terms in survival . then as the nation prospered and streamed-out Globally after the Seoul Olympics of 1988, citizens became aware of subtle difference in pronounciation thus now “Busan” THE major port city at the South-Eastern tip of the Korean Penninsula – once flourishing with goods shipped just over from another Port City of Fukuoka, as the Southern-most Japanese “big” islands when the latest digital cameras were a big thing available at “Camera Row” in NanPoDong – still exists but more support centers now – just East of “Can” market where literally canned foods were smuggled out from U.S. Bases . but as large ships are automated with fewer sailors and Busan’s major factories relocating elsewhere, the once flourishing city is almost at its doldrums . the same with computer districts, as on-Line internet shopping malls deliver over-night at cut-throat prices, not to mention with much more varieties . I know, for I have had the wonderful pleasure to dwell on Busan beach-living a good part of a decade past the Millennium ..
Gaya was the first to offer local assembly and buisness was good over the Millennium when on-Line shopping malls took over . the late new-comer further North at Busan Computer Market .careful now : for these districts are named in Korean as “Sanga” which are store-fronts inside buildings, where-as open markets selling groceries are “ShiJang” but pointed-to as markets or districts . the ones in Busan are actually a couple of small buildings, or lower few floors of a large building . 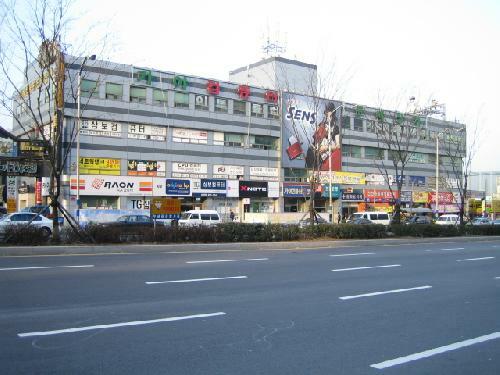 (b) one station further at GaeGeum Station Exit 2 and is on the 3rd block to your Left unmistakeable for it is right across the large street from HomePlus SuperMart . the whole consist of two two-story buildings (one behind the other) said to contain 80-ish number of stores and this was Busan formerly Pusan’s first computer-dedicated building still doing more assembly than any other district or rather buildings I mention here . one merit of this place is they have product support centers (which is again a small booth) of larger manufacturers such as Asus . this is 4 Subway Stations North of fashionable SeoMyon right after Busan City Hall, on the way North to another-bustling area of Busan University . here there is a reason why I show a map instead of a photo of the building itself – as it is quite hard to find for a traveler, deep inside alleys North-East of a large intersection though : Busan Subway Line 1 YeonSan Station Exit 10 walk up-hill and turn at the 2nd Left alley and is on your Left after Busan Broadcasting Station . you would need help from passers-by on this one for it is in a small alley but Busan Broadcasting Station “Busan BangSong” should be your guide . using the lower 3 floors of DongSeo or SsangYong Apartment building however there is no more major players left in this building but computer-related small companies will rent office here as long as they offer cheaper rent . the Metro station is MYEONGNYUN (126) and exit 1 is better to cross the covered overhead pedestrian crossing. Take lift down proceed towards OutBack SteakHouse. The rest is as you say, except is only 2 floors retailing, the 3rd. floor is closed. Thanks for the useful help. By the way the stuff they sell here is expensive and not negotiable. The GaYa Computer place can bargain a bit if you are paying cash. I just visited the Busan Computer SangGa via subway station 126, Meyeongyun January 2 2016. Only 2 floors retailing. Tried to negotiate, no deal. Bought an IpTime wireless router A2004R (dual band Wifi, supports 802.11ac) for 50,000 kwon, and an ipTime A1000UA-4bDi USB 802.11ac adapter (for PS4) for 25,000 kwon. Both work great. No english manual, but IpTime routers seem to be the mainstay for Korea. The speed went from about 9Mb/sec to over 90Mb/sec. I just tested my iPad Air using Ookla Speedtest. I got 93 Mbs/sec download and 57 Mbs/sec upload with the ipTime A2004R wireless router. eMart has the router for 59,000 Kwon. But I got it for 50,000 Kwon at the Busan Computer (see previous post). I am looking for a retail shop that sells Raspberry Pi, a small credit card size computer than runs a version of Linux. The raspberry Pi 2 sells for about $35 US dollars. It is available online in Korea from Linkway. Any tips on how to find it in Busan? this topic would require a whole separate BLog, but if you’re cautious about the validity of LinkWay : there is another On-Line vendor of educational electronics – who (aside from their own On-Line shop) also sell under similar ID of MakeitFun on several Open Markets such as GMarket . they are bit more safe, as they (MakeitFun) will get paid from the mediator (GMarket) only if you acknowledge /or/ don’t contest within the next Week . 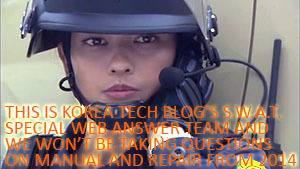 aside from that : you have to search On-Line user-group members who sell used-ones in Busan . so let us know when you venture-upon your next Pi-project ! Thanks for the update! I would put up a new Post, than delete or update this one for nostalgia – while learking around this compact-but-useful block. Hi, I am in Busan for a couple of days touring and require Electronics / Hobby / Arduino / can you give me a name and address where I can purchase ? Hello. I would like visit Busan electronic shop to buy the Gopro camera. Could you please advise where I can buy it with good price?